Rajasthan is famous for many things such as garments, bags, and home furnishing items among others. The main reason for which these things are demanded and renowned worldwide are their unique patterns and breathtaking designs which reflect the core of Indian culture and tradition. To spread wings of our culture all over the world, we, Nikita Home Furnishings emerged in the market as a prominent manufacturer and exporter of a huge variety of items. Our offerings include Garments, Bags, Pouches and All Type Of Home Furnishing products such as Cushion Covers, Kantha Quilts, Kantha Bed Covers, Poufs etc. 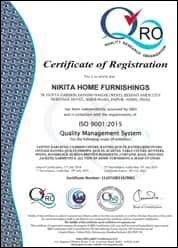 Our company has ISO 9001:2015 certification for exercising a strict quality control system. In addition to this, we are an Indian Government and Rajasthan Government Registered Organization. We proudly boast that we are a Government Recognized Exporter who have made the contenders in international markets notice our presence, by attracting crowd towards us. Since the establishment of our company, we have given the best ever experience to the customers whom we have served flawlessly. We aim to make our products recognized in the global markets and attain a place of prominence in the industry. Why To Choose Our Offerings? Suitable and high quality fabrics are used for different items. All our items attract customers with their elegant designs. People love the color combinations as well as the patterns that we offer which are otherwise not available anywhere. Today we are serving thousands of customers all across the nation and abroad. We feel proud when we see them satisfied by our services. One of the best things they are pleased with is our prompt delivery system because of which they get their consignments within the stipulated time. We never delay or ask for extra time to prepare the orders, and even our employees make sure that the assortment is ready much before time. Additionally, we have started accepting payments through multiple online and offline ways so that our clients are always at ease.